So at the end of the Academy Awards as I said, Frozen won the Oscar for Best Animated Feature Film. Back when I reviewed Frozen, I said that it deserved to win the award over animation legend Hayao Miyazaki’s final movie, The Wind Rises and I stick by that assessment. But some might be asking the question, well Tanner what do you think of The Wind Rises? The answer to that is that I find myself in the same situation that I did last year with deciding what was better between The Last of Us and BioShock Infinite. They are both phenomenal movies in their own right and for different reasons. Even though it is a tough decision, I still hold to what I say. 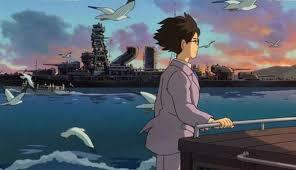 But I did not think it would be a terrible idea to review The Wind Rises and give my compare and contrast at the end. So with that said, let’s review what is possibly the last film in the legendary and storied career of Studio Ghibli’s Hayao Miyazaki. 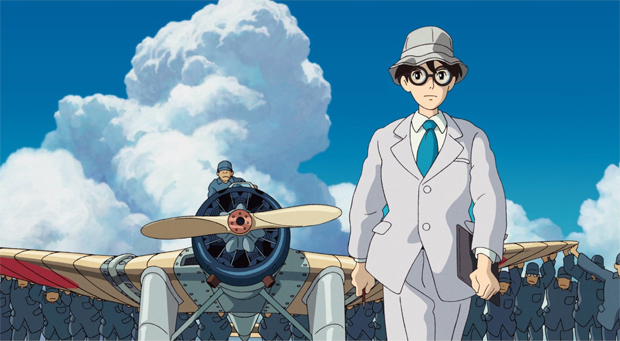 The Wind Rises is the story of Jiro Horikoshi (Hideaki Anno/Joseph Gordon-Levitt). Jiro is a young man who is growing up in the late 1800’s early 1900’s pre war Japan and has become enamored with planes and aviation. Sadly, due to his poor eyesight he cannot be a pilot, so instead after a dream that featured Italian Aviator Giovanni Caproni (Nomura Mansai/Stanley Tucci), he decides to become an aeronautical engineer. He travels to Tokyo to attend college, but on the way a massive earthquakes hits Tokyo sending the city into upheaval and the city begins to burn. Jiro helps two young women who were on the train with them, a young woman named Naoko (Miori Takimoto/Emily Blunt) and her maid Kayo (Mirai Shida/Mae Whitman) who broke her ankle on the train ride. Jiro and his friend Honjo (Hidetoshi Nishijima/John Krasinski) graduate with flying colors and get jobs working on designer Japanese fighters for the military. They try valiantly to create high functioning aircraft, but due to being technologically behind the rest of the world, they fail. Eventually Jiro is sent to travel around the world in order to gain experience to design a more sleek aircraft. This leads him to a summer retreat where he is reunited with Naoko and together the two begin to form a relationship. The story then follows Jiro as he shares his life with Naoko and continues to labor on creating the perfect plane for the Japanese military. It is Hayao Miyazaki… So of course the animation is perfect. I would expect nothing less than perfection with a track record such as his. The colors, the design of the planes, and the attention to detail in every inch of the scene is a staple of Miyazaki’s work. I’m not going any further than this, because it is the most expected of all the categories. Of course the animation is wonderful, it’s Miyazaki. 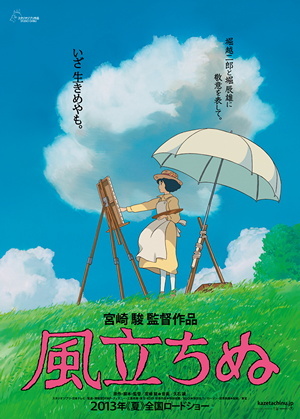 Unlike other stories of Miyazaki’s that feel very loud and boisterous like Howl’s Moving Castle and Spirited Away, The Wind Rises is a much more quiet story about an engineer living in Pre-War Japan. There is no magic, there is no grandiose nature to it, it is a simple and quiet love story with the message that your passion and dreams may be corrupted by those around you, but to not let that stop you from doing what you love to do. I love that we get to see a movie about World War II without the film attempting to tell us what to feel and how to think. This is looking at civilians from the Axis Powers and neither villainizing them for being on the wrong side of war nor making them overtly sympathetic. It is a story of human beings being human beings. You can understand that Jiro, like his influence Caproni does not want his planes to be used for war, but understands that it is as Caproni puts it ‘a cursed dream’. He still does what he loves to do knowing that his design will be corrupted. It is a wonderful story about an artist watching his design be corrupted by those around him, but never letting that get in the way of doing what he loves to do and it is executed flawlessly. So we come to an end of the legendary career of one of the greatest animators to ever work in the industry, Hayao Miyazaki. Whether or not we will see more from him after this, who knows? But for now, this is one hell of a way to call it a night. The Wind Rises may be the least ‘Miyazaki-esque’ film I have seen and it benefits from that. There is no magic, it is set in our world during a time of war, it is very quiet, very reserved, and it benefits so well from this. It is an animated movie that makes the characters more alive and more human than any actor or actress could ever hope to portray. So in conclusion, allow me to share why I still think Frozen is the superior film over The Wind Rises. Both are marvels in their own right. Animation, style, and story; these two movie have the full package. But at the end of the day what I have to go on that separates these two is the legacy that they will leave. Years from now when people look back at Frozen, they will remember it as a timeless classic. The scene where Elsa lifts the ice castle out of the snow will be in every Disney montage you will see from here on out. Frozen is going to be shown to children and their children’s children and so forth. The Wind Rises is an animated marvel and an astonishing work. But when people bring up Hayao Miyazaki and the work that he did with Studio Ghibli, this will be one of the last films mentioned out of the storied list that includes classics like Howl’s Moving Castle, Princess Mononoke, and of course Spirited Away. In a way The Wind Rises biggest downfall is the fact that it is more quiet and reserved then its predecessors, which is by no means a negative, just the reason that Frozen was able to edge it out. Thank you for reading and as always if you enjoyed this review, then please like and subscribe for more. I will have a new review up Thursday and hopefully a new release on Sunday.